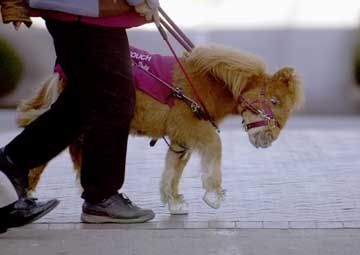 JASPER, Tenn. -- For months, Tiffany Masterson, 7, prayed to own a pony before her lifelong struggle with deteriorating health would make it impossible for her to take care of a pet. Now, the first-grader is in a court battle to keep Keepsake, the miniature horse she got in November, at her Jasper, Tenn., home. "Keepsake means a lot to Tiffany," said Pam Kitchens, the child's mother. "She works with her every day. The horse is a gift from God." Ms. Kitchens said a Chattanooga benefactor gave the 10-year-old, 130-pound horse to her daughter, who was born with spina bifida and a rare degenerative brain defect, called Arnold Chiari Syndrome. But two days after the horse's arrival in Marion County, Ms. Kitchens was charged with violating a Jasper ban on exotic animals in the city. 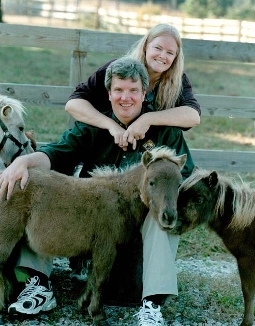 At a December court hearing, she was ordered to get rid of the tiny horse. "We have an ordinance that prohibits an animal other than a dog or cat from being within 1,000 feet of a residence or business within corporate limits," said Zach Kelly, Jasper city attorney. "The family had applied for a permit and it was denied. Then, the horse shows up anyway, so Ms. Kitchens was cited." Mr. Kelly said that Ms. Kitchens appealed last month's decision by the municipal judge and that the Marion County circuit court would next hear the matter, probably in February. But by then, Ms. Kitchens said she plans to reapply for a permit, this time claiming that Keepsake is a "service animal," as defined by the Americans with Disabilities Act of 1990. "A service animal attends a person with a disability in order for the disabled person to have access to places," said Chattanoogan Daniel Deane, an advocate with Access Now, who is championing Tiffany's cause. "It must be trained for its job. It can't have a negative impact on any facility that it enters," he said, "and while it's rare for a horse to be a service animal, this isn't the first time that it has happened. 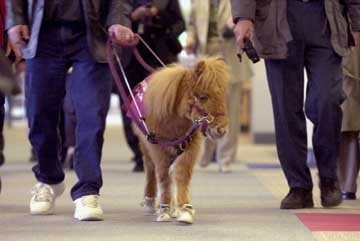 "A horse would be an appropriate service animal to move a wheel chair and to help pick up things for a disabled person. 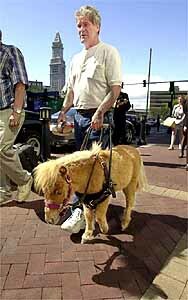 And in my mind, Tiffany's horse is a service animal," he said. When he learned of the youngster's situation, Mr. Deane said he contacted Dr. Fred Shotz, president of the Miami-based Association of Disability Advocates in Florida. 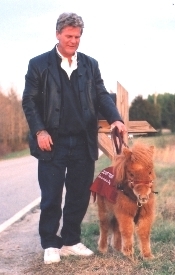 After visiting the Kitchens' home to assess Keepsake's role as a service animal, Dr. Shotz faxed a letter to Mr. Kelly, stating that, according to the ADA, forcing the horse's removal would violate the child's civil rights. "They are taking the position that the horse, like a seeing-eye dog, should be permitted under ADA guidelines," Mr. Kelly said, "but the matter is still in court. "We're certainly sympathetic to Tiffany's situation, but we are trying to enforce the ordinance. There are several neighbors who are adamantly opposed. They think the horse will become a nuisance." Keepsake, fully grown at 30.5 inches high, lives in a large storage shed that the Kitchenses built on their quarter-acre lot. The yard is fenced, but it adjoins the quarter-acre property belonging to Ms. Kitchens' parents, allowing the animal a range of "about a half-acre of ground," according to Mr. Kitchens, who also built a ramp so the horse could be led into the family home. "The horse comes inside every day and has never used the bathroom indoors," Ms. Kitchens said. "She paws on the ground when she needs to go outside, but she doesn't use the bathroom in the yard either. She uses a corner of her shed." 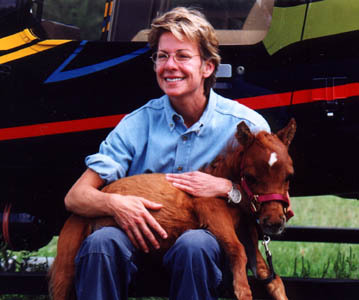 Mr. Deane said that the new permit application the Kitchenses are filing "includes stipulations that, for now, the horse will be used on their property only, that the area will be kept in a healthful condition and that there will be further training for the horse so it can be used in public." For further training, Keepsake and Tiffany will be going to The Guide Horse Foundation in Kittrell, N.C., as soon as arrangements can be made, according to Ms. Kitchens. "People don't realize how useful these little horses can be, and there is a special bond between these two," she said of the girl and the horse. "Tiffany doesn't walk well, but Keepsake helps her keep her balance. 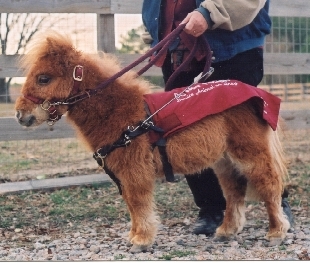 Tiffany gets tired easily and when she does, she can pull herself up using the handles on Keepsake's harness. She's a service animal in every way." As Tiffany's condition worsens, she will become even more dependent on the horse, according to her mother. She said that in recent months, the child has lost bowel control and bladder sensation and her seizures are becoming too frequent for her to regularly attend her special education classes. "In the future, Tiffany will be in a wheelchair. 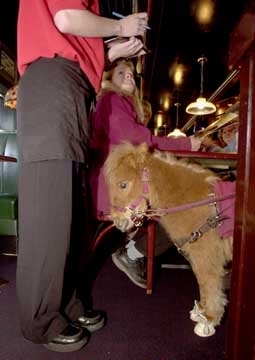 When she is, the horse can help pull the chair," Ms. Kitchens said. Mr. Kelly said the city "is not the bad actor here. It's not like the city wants to deprive a little girl of an animal. "There are several locations near her house where the horse could be kept without charge," he said. Ms. Kitchens said she would "fight, tooth and nail" any effort to relocate the horse. 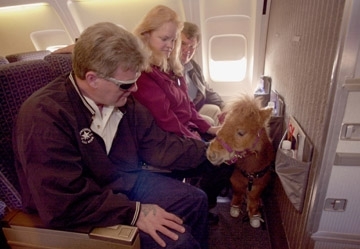 "That service animal needs to be right here with Tiffany or what's the use of having it?" she said. "It's kind of weird that, even before Tiffany was born, somebody named that horse Keepsake. She was destined to have that horse," she said. "They aren't taking her Keepsake away."